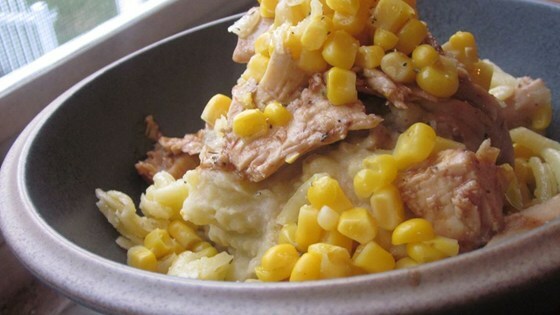 "A self-created comfort food, these mashed potatoes are a little weird, but entirely too good! I will occasionally add sweet corn for a bit of crunch." 1Place the potatoes, carrots, and garlic into a large pot and cover with water. Season with salt, black pepper, paprika, onion powder, thyme, basil, oregano, and marjoram. Bring to a boil over high heat, then reduce heat to medium-low, cover, and simmer until tender, about 20 minutes. Drain and allow to steam dry for a minute or two. 2Return the potatoes to the pot, and mash until smooth. Fold in the butter, Cheddar cheese, Worcestershire sauce, barbeque sauce, and popcorn chicken until the cheese has melted. Stir in the hot milk until absorbed and serve.